Hourandou – Togetsukyo main store is located just off of the south end of Togetsukyo bridge. This shop is a wonderful place to sit back and take a break after touring around Arashiyama. On the second floor of the shop is the eatery. You will be taking off your shoes upstairs and then enter a tatami room lined with 10 tables of 4 seats each. The calm ambiance will help you eliminate some fatigue you may have gotten from all the walking. Horandou specializes in beans and Warabi mochi, a Japanese confectionary made with warabi root starch, sugar, and water. You will be able to identify the shop by noticing the blocks of Warabi mochi being cut and prepared or boxing in front of the store show window. 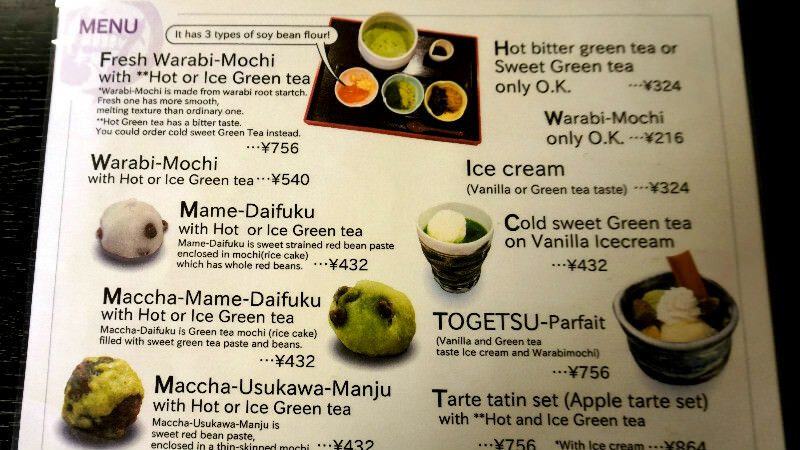 Togetsu Parfait consists of three types of Warabi mochi with vanilla and green ice cream. If you feel that Warabi mochi is bit too challenging to try for the first time, why not try the parfait that have familiar and irresistible taste of ice cream that compliments pieces of Warabi mochi. The staff will bring out some black beans and roasted tea right after you are seated. Simple black beans have sweet taste that goes well with tea. These make a great nutritious snack! Look for them in the shop downstairs so you can buy some for later. Three types of Warabi mochi are included: kinako (roasted soy bean), matcha (green tea), and black sesame with bamboo charcoal. Pour some molasses over them for added sweetness according to your liking. The black sesame Warabi Mochi is made by mixing bamboo charcoal. They are the most unique ones out of all and an interesting one to try! Have you tried wasabi flavored peanuts before? Try some Wasabi flavored peanuts! These are sweet peanuts with the kick of wasabi creating a great medley of flavors. At the shop of Horandou on the 1st floor, you can try most of the products before purchasing them so you can make sure to purchase only the things you like. There are arrays of different flavor beans, peanuts, and Warabi mochi. Many domestic and international visitors purchase them as souvenirs. This Japanese sweets cafe specializes in mochi rice cakes. They have three flavors of warabi-mochi: kinako (roasted soybean flour), matcha, and black sesame with bamboo charcoal. Also, the roasted black beans you get with your tea taste great. Why not buy some beans or some other Japanese sweets, go to a bench by the Togetsu-kyo Bridge and enjoy them while looking at the great scenery? There are first floor and second floor sit-in spaces.